Dermot Looney, a 31-year-old teacher, said he believes that Labour has abandoned its principles while in government. Dermot Looney pictured with some of his former pupils. THE MAYOR OF South Dublin County Council has resigned from the Labour party, becoming the 27th councillor to leave the junior coalition partner in three years. Dermot Looney, a 31-year-old teacher who represents the Tallaght Central area of Dublin, had already been selected to run again for the party in May’s local elections. He said the decision to leave the party he had been involved in for more than a decade had been difficult but he believed it was the right thing to do. “My time in the Labour party came to a natural end. I’d no distance left to run,” he told TheJournal.ie this evening. “I made the decision about a month ago but the reason I didn’t go then is that there was a budget [for South Dublin County Council] to get through, where I managed to make some gains for people in the area, and it was the right thing to do to stay until that was done”. Looney was strongly criticial of Labour, saying the party had abandoned its principles while in government with Fine Gael. Looney said there was no one policy on which he was making a stand, but that there had been dozens over the lifetime of the Government with which he fundamentally disagreed. He said Labour had ‘kowtowed’ to Fine Gael’s economic agenda to the detriment of the poorest people in society. “I stand diametrically opposed to government policy – and by extension, that of the Labour Party – in areas as diverse as healthcare, local democracy, housing, state assets and taxation,” he said. He also criticised the running of the party. “The party is run very strongly from the centre, and councillors like me are having less and less of an impact,” he said. He cited the recent party conference as an example, where, he said, around 20 motions from members weren’t allowed to be brought to the conference floor. Looney said the reaction so far to his resignation had been “overwhelmingly positive”. He told the Labour councillors on South Dublin County Council and local party members of his decision before it was made public tonight. Looney will remain on as mayor and councillor ahead of May’s elections. He ruled out running for any other party and said he would be standing as an Independent in the local elections. “I’m definitely not running for another party,” he said. “I’ll see what I can do both nationally and locally as an independent, possibly working with other groups from the left”. Looney had been a member of the party for more than a decade after joining while studying social science in UCD. 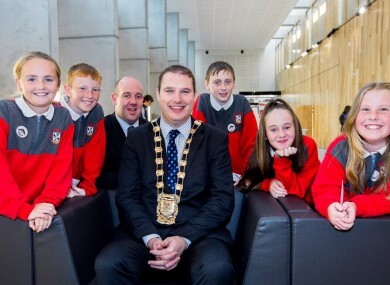 He was first elected to South Dublin County Council in June 2009 and became the youngest ever mayor of the local authority when he took over the office last year. Looney made the news last year when he donated €7,000 of his €45,000 allowance as mayor to local community groups. Email “Gone: South Dublin mayor resigns from Labour party”. Feedback on “Gone: South Dublin mayor resigns from Labour party”.